Alexis has a head for organization—but what about her heart? Alexis Becker is by far the most prepared, very exact, and extremely organized Cupcake Club member. But there’s more to Alexis than meets the eye. Like the fact that she has a messy drawer, and that she likes to secretly dance in her bedroom. And the biggest secret of all? Alexis has a crush! But is there a formula for love? 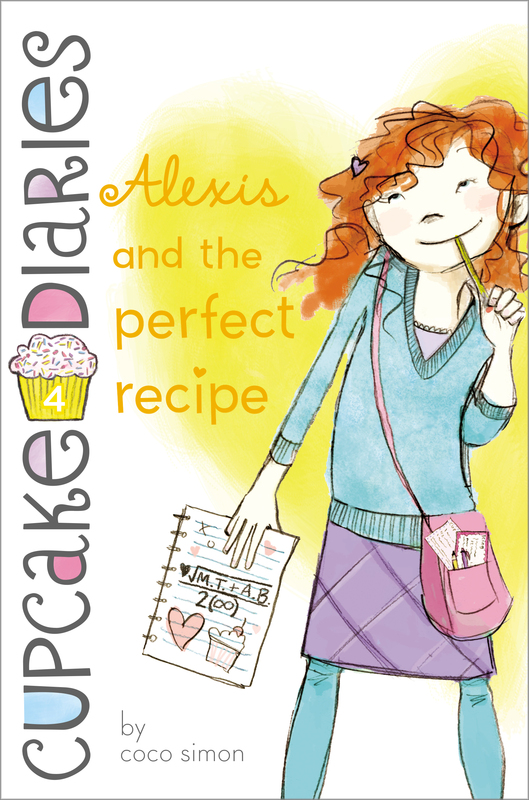 My name is Alexis Becker, and I’m the business mind (ha-ha) of the Cupcake Club. The club is a for-profit group that my best friends—Mia, Katie, and Emma—and I started, and we make money baking delicious cupcakes! I love figuring out how to run a business and putting together the different building blocks—math, organization, planning—that’s why the girls can count on me for this kind of stuff. Plus, as you can tell, I love math-related puns! My friends are more creative with the cupcakes, so they come up with the designs and other artistic stuff. My one specialty, though, is fondant. I am very good at making little flowers and designs out of that firm frosting. Otherwise, I’m mostly crunching numbers and wondering how to make money. Mmm . . . money! We actually have lots of fun doing it. Most of our clients are really nice people, which is much more than I can say for our latest client: my sister, Dylan. I can practically still hear her fuming. “It is my party, I am the one turning sixteen, and I have budgeted everything down to the last party favor. I know exactly what I’m doing!” She was talking to our mom behind closed doors, but I heard every word since I was right outside her bedroom! Dylan never gets out-of-control mad; she’s always in total control. Except that ever since she’d started planning her sweet sixteen party (which was now four and a half weeks away), she’d been cranky a lot. But she never raises her voice when she gets mad. She lowers it to a whisper, and you can hear the chill in it as if actual icicles were hanging from the words. I had to put my ear to her bedroom door to hear everything that was being said. Knowledge is power; that’s one of my mottoes, and I need all the information I can get. About everything. I grinned. Mom was on my side. There were some muffled comments and I strained to hear them. Maybe I’d hear better if I put a glass against the wall like I’d seen people do on TV. Or maybe I should lie down and listen through the crack under the door. I pulled my hair into a ponytail, and then lay on the hall rug outside the door. “The Taylors! Mom! The whole family? That wasn’t in my head count!” The Ice Princess was losing her cool, but I didn’t focus on that. All I could think of was that Emma’s whole family might come. And that was very interesting. Jake is much younger, so he’s cute but not exactly a pal of mine, and Matt and Sam are older, so we don’t really pay attention to them, and they don’t pay much attention to us. What changed everything was that I had a little direct contact with Matt. He’s eighteen months older, but only one school year ahead (he’s in eighth grade at Park Street Middle School). Usually I am with Emma when her brothers are around, so I guess I see them from her point of view. But this time I had to call Matt for help with something for Emma, and it wasn’t until he said “Hello” on the phone that in one strange, sudden moment, everything changed. So what happened? First off, I am very efficient. When something needs doing, I just do it. When someone needs calling, I just pick up the phone and dial. And that was what I had done, without even thinking about it. But Matt’s voice sounds much deeper on the phone than it does in person, and when I heard it, it threw me off and I panicked, like, Who is this person I am talking to? and Why did I call him, exactly? I kind of had an out-of-body experience. I suddenly realized I’d called a boy, and I almost dropped the phone! But thanks to caller ID he already knew who was calling, so I couldn’t exactly hang up. Then, just to confuse me further, in the course of our (very brief) conversation, Matt told me how worried he’d been about Emma, and that he felt bad for some things she was going through at the time. I didn’t think boys worried about anyone! And feeling bad for someone? That is just unheard of! Suddenly Matt seemed like . . . a real person. With feelings! In the end, it was I who rushed us off the phone. I suddenly got really, really nervous and couldn’t believe I’d had the guts to call Matt in the first place. You know in the old cartoons when the coyote runs off a cliff and his feet are still spinning, but he’s in midair and he only falls when he realizes it? That’s what happened to me. And now, when I heard Dylan talking about the Taylors, all I could think of was Matt. And that gave me a funny feeling, like fish were swimming in my stomach. I hope he comes to Dylan’s party, I thought. Or maybe I don’t. Ugh! I don’t know what I want! Suddenly the door flew open, and Dylan shrieked when she saw me lying on the floor. I blinked as the bright light from her room hit me. “I hate this family!” Dylan wailed, stepping over me. She stomped down the hall to the bathroom and shut the door as hard as possible without actually slamming it. “Alexis, honey, what are you doing there?” my mother asked in her “patient” voice. I rolled up on one side and propped my head on my fist. “Just interested in the outcome of everything,” I replied. My mother smiled at me and shook her head. “You’ll get the job, all right, but these better turn out to be the prettiest and tastiest cupcakes you’ve ever baked,” Mom said. She’s pretty tough. She’s not a CPA and a CFO for nothing. Dylan drew back her leg like she was going to kick me, and I rolled away and sprang to my feet. “Girls! Counting to three!” Mom yelled. “Wonderful!” I repeated, raising my arms in victory. I put up my hand and my mother gave me a stiff-handed, silent high five. (She’s not the high-fiving type). “I saw that!” accused Dylan from under her pillow. My mother and I exchanged a guilty smile. I rolled my eyes, and we left Dylan to her moping. “Thanks, Mom,” I whispered once we were out in the hall with Dylan’s door safely closed. “Black-and-gold ones! Coming right up!” I said, and we laughed. We started down the hall. I did a little cha-cha-cha step. I’m obsessed with all the TV dancing shows and like to practice dance moves whenever I can. Music and dance is kind of mathematical, which is why I love it. There’s a logical and organized pattern to everything—the chords, notes, and dance steps. “Is Dylan really mad, do you think?” I asked. All joking aside, I did not want Dylan as my enemy. She is my only sibling, and we are usually pretty good friends. “Sounds fair to me,” I agreed, and I went to e-mail the Cupcakers with the good news. All we needed was a great idea, one that would keep Dylan from killing me. Oh yeah, and it had to be black and gold! I just wished I could e-mail them about Matt Taylor being invited to the party. But what would I say?